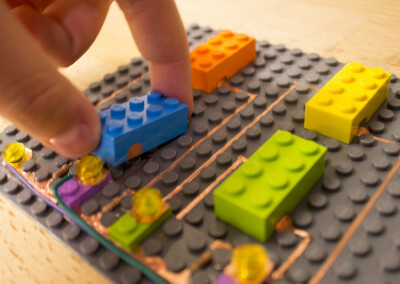 LEGO® circuits is a tool for quickly prototyping electric circuits. Playful and easy to use. 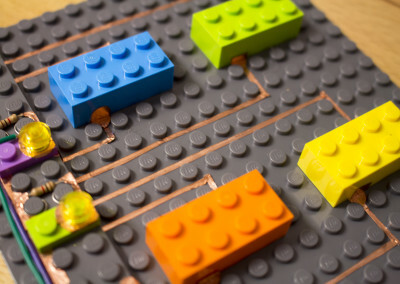 Taking advantage of the brick’s sturdy connections and its colorful pieces, different electric components are easy to identify and join with each other. 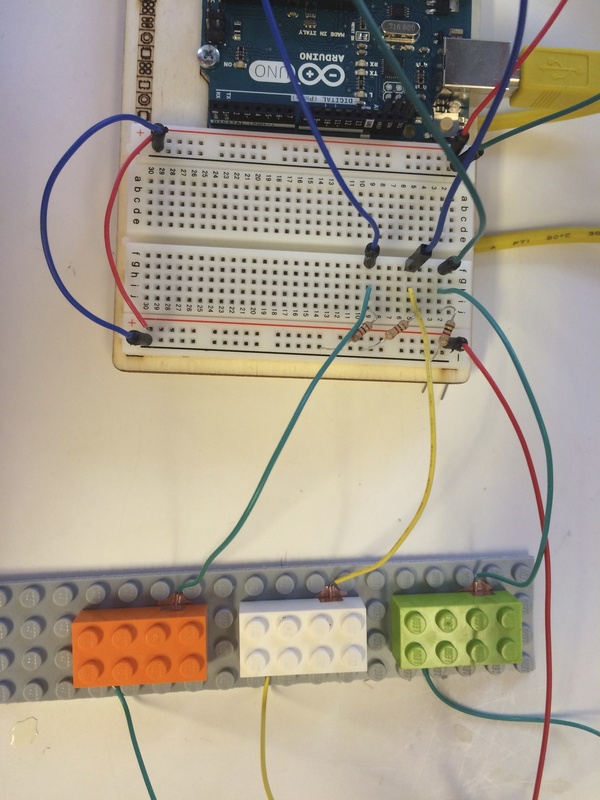 I developed LEGO® circuits during the Physical Computing course at CIID, working on the Sound Blocks project with Andreas Refsgaard and John Ferreira. This project was developed independently and, although it uses LEGO® bricks as its main material, it is in no way related to the company. 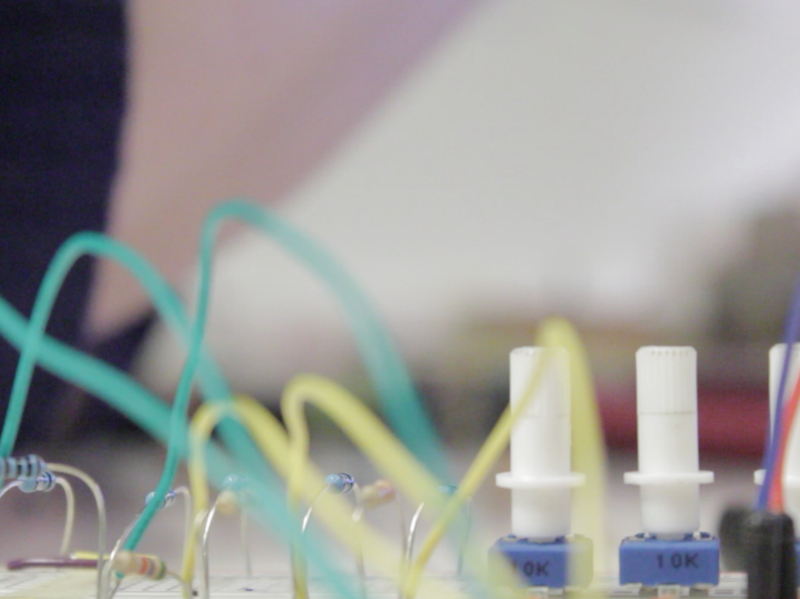 While prototyping for the Sound Blocks project, I had to find an easier and reliable way to connect blocks, and identify what I connected and where. For this I decided to use resistors and a voltage splitter. 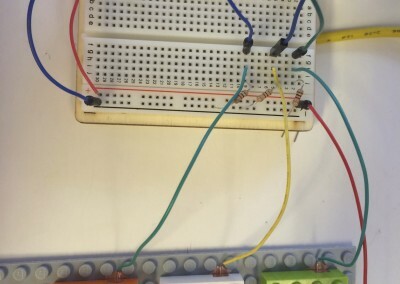 But wires and a bread board are too inefficient when constantly changing the components. I needed to prototype the interaction of connecting pieces together. 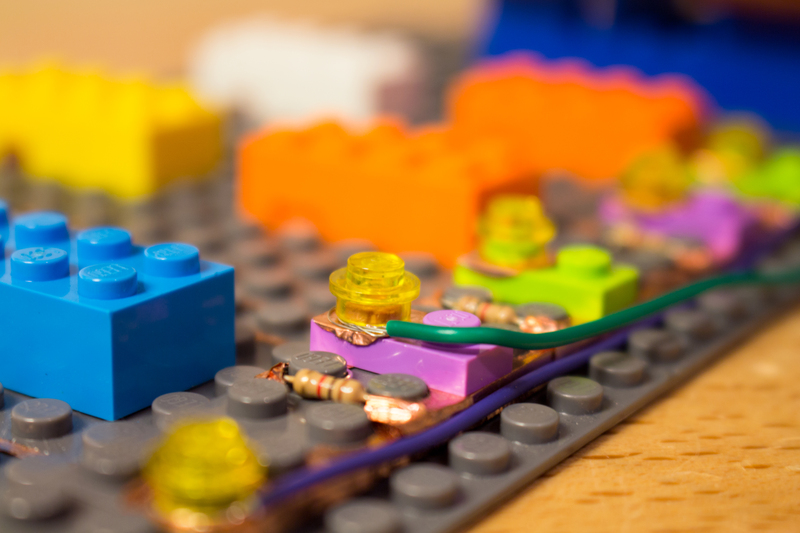 Looking for materials to use, I found a box of LEGO® bricks, and decided to use them. I found that because of its color, material and sturdy connections, they functioned extremely well as building material. Another advantage is that with this blocks, it’s possible to make 3D circuits, layering connections on top of one another. 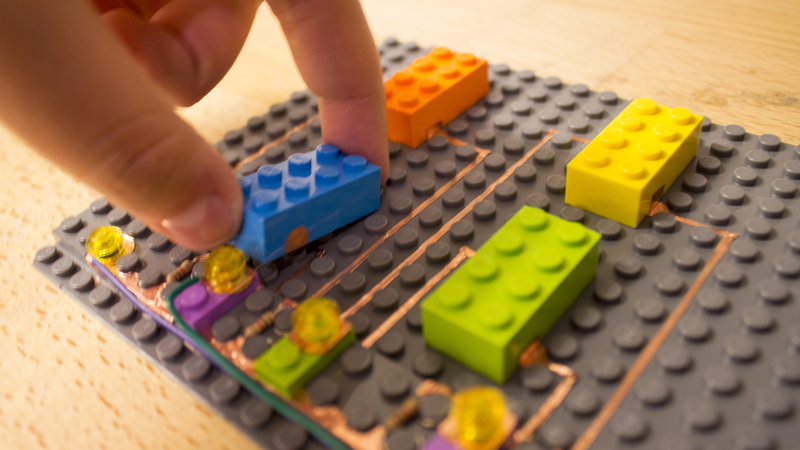 I placed resistors inside of the bricks, and, with conductive tape, made the connections. 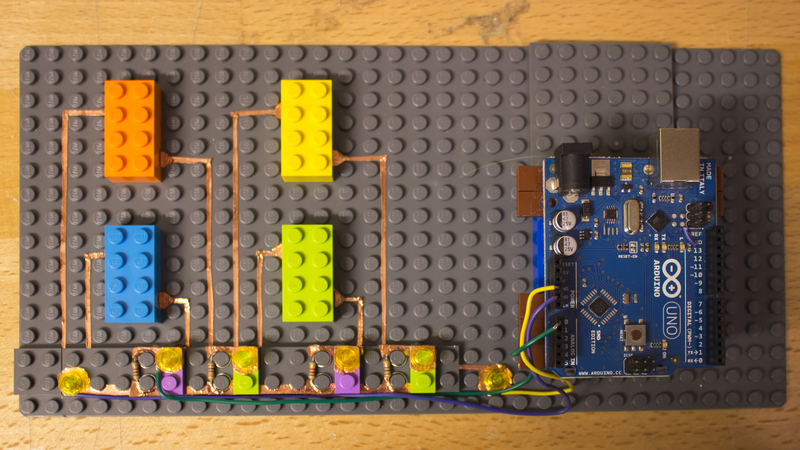 I used a different colored brick for each resistor value, and then used circular pieces to keep the wires that would go into the Arduino in place. This project could be continued. 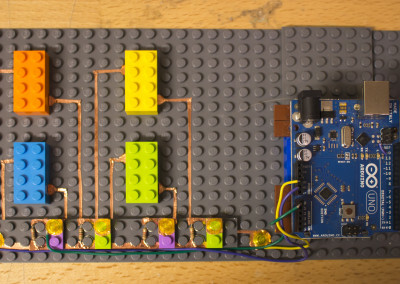 A LEGO® Arduino board could be built, and different electric components could be marked with different colored bricks. 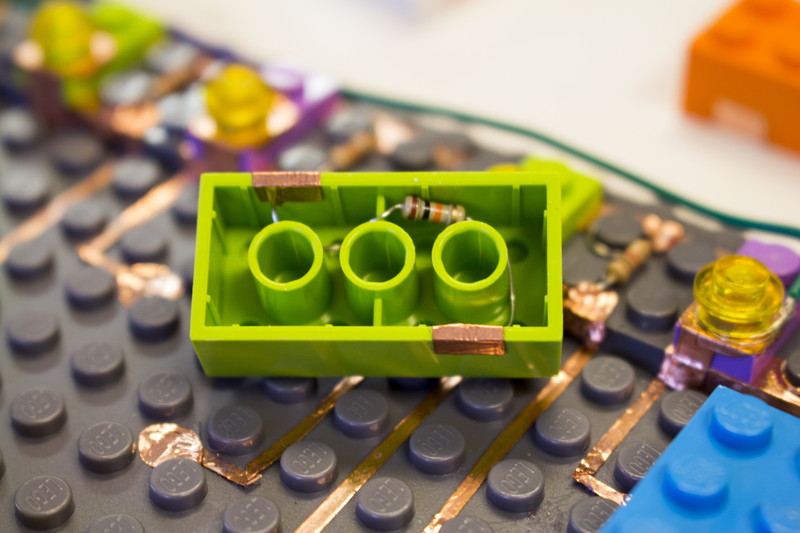 Since I designed the circuit, I have used LEGO® bricks as a prototyping tool for many other projects.